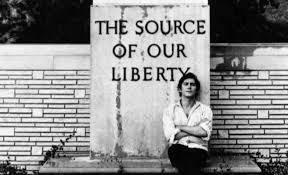 In America at least, Phil Ochs was primarily known as a protest singer, and some of them were truly terrific. I think in part he wrote them because he had a very idealistic conception of America and of the American people. That’s why I include this song, “The Power and the Glory,” which is the first song on his first album, as well as (I think) his last single. Towards the end, I believe he was consciously trying to recapture his earlier feelings of hope and optimism, as well as an intoxicating creative energy and productivity. In fact I basically look at “The Power and the Glory” as Phil’s attempt to write an early 60’s version of Woody Guthrie’s “This Land is Your Land.” Notice that a lot of responsibility is placed on the American people actively working to maintain their country as a morally upright and even empathetic nation.